Episode 34: "The Point of No Return"
Still in Venice, Italy from his previous adventure, Charlie Chan visits Inspector Bonini at a casino where he overhears the wealthy John Benson claim that "constant winning can be a bore." Bonini mentions that Benson and his beautiful wife recently moved to Venice and rented a villa. Chan remarks that Mr. Benson looks familiar. The inspector notes that Benson is "addicted to water sports…especially skin diving." Introduced to Benson by Bonini, it is soon made clear by Benson that he and Chan have never met in Honolulu or in California as he strongly denies the detective's suggestions. At the Benson's villa, Alice Benson is with her lover, Dr. Paul Durrant, who has suggested that they ask her husband to let her go so that they can marry. A resigned Alice replies that her husband would never agree to that, even though he does not love her, and may even hate her. Returning home as his butler, Blair, prepares his skin diving gear, John Benson confronts Dr. Durrant and threatens him with arrest if he comes near his wife again. As Durrant is shown out by the butler, he states that Benson has not heard the last of him and that he will be seeing him very soon. Later, back at the casino, Chan, seeing Mr. Benson, strikes up a conversation. Benson explains that he is now retired having made a fortune through "initiative, imagination, and hard work." Chan, probing, asks if Benson made his money in California. Benson reminds Chan that he had already told him he had never been to California. Chan apologizes adding that he now realizes that his confusion is due to Mr. Benson's strong resemblance to a person named Arthur Waylon whose picture was a bulletin released by police in California a few years before. Offended, Benson gets up to leave. Before he goes, Chan notes to Benson that Waylon is a swindler who is wanted in many countries. As Benson leaves, Chan carefully takes the glass that Benson was using. Back at his villa, Benson places a telephone call to Henry Winslow in London. While awaiting the operator to call back with the connection, Alice enters the room as she is about to go out shopping. Benson writes "5 mgs. cyanide" on a paper note and hands it to his her, asking that she pick it up at a chemist's for him and bring it right back. Speaking with Winslow on the phone, Benson tells him to come to Venice as soon as possible as Charlie Chan has stumbled on to them. With Inspector Bonini the next day, Chan explains how he knows that Benson is, indeed, Henry Winslow as his identity was confirmed by the fingerprints he had given to Interpol for analysis. Chan and the inspector go to the Benson's villa. There they find that Benson is inexplicably gone as they speak with his wife with Dr. Durrant present. A visibly worried Mrs. Benson explains that her husband went out spear fishing earlier that morning and hasn’t been seen since. Suddenly, Blair enters, carrying Benson's air tank which he says he found on a secluded beach, having marked the exact spot. 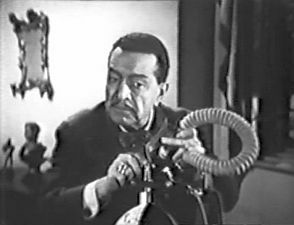 As the Inspector gives Mrs. Benson his sympathy, Chan checks the recovered equipment and declares, "This is no accident." It is determined that the air tank contains cyanide which, even in a small amount, would be fatal to anyone breathing the contents of the tank. As Mrs. Benson suggests that her husband may have done this to himself, she adds, in answer to a question from Chan, that she and her husband had not been getting along of late. Chan then suggests that such a method of committing suicide is too complicated. Blair then states that he had filled the tank with air himself, and, that even though he disliked his employer, he was not alone in that regard. Chan notes that as the air tank was, according to Mrs. Benson, left in the open at the villa, anyone could have had the opportunity to tamper with it. During all of this, Henry Winslow arrives, stating that he had an appointment with Mr. Benson. Upon questioning by Inspector Bonini, Winslow explains that he arrived the night before and had met with Benson to discuss business. Winslow adds that the nature of the business was to create a new will in which he is the sole beneficiary of Benson's fortune. Blair then produces the will which he states was given to him the night before and was, in the event of his death, to give it to the police. When the will is read, it is found to state that Benson feared for his life and believed that Dr. Durrant and his wife had plans to kill him. Due to their admitted relationship, Mrs. Benson and Dr. Durrant appear to be the prime suspects. Durrant states that although he is not sorry that Benson is dead, he had nothing to do with it. Leaving the villa, Chan searches along the beach, seeking the spot where Blair stated he had found Benson’s air tank. Finding the spot, marked by the butler as he had earlier noted to the detective, Chan makes a number of observations and returns to meet with Inspector Bonini at his office. Chan presents his study of the local currents which would have resulted in the body of Benson being washed ashore at a certain point along the beach. As this was not the case, chan suggests that a killer may have taken the precaution of insuring the body would not be recovered. Inspector Benoni proves skeptical and continues to believe that Mrs. Benson and Dr. Durrant are responsible for Benson's demise. A phone call to Bonini from one of his men reveals that Mrs. Benson purchased a quantity of cyanide from a local chemist the day before his disappearance. Bonini heads off with a doubtful Chan to place Mrs. Benson under arrest. At the villa, Mrs. Benson explains that her husband had asked her to purchase the poison, and even wrote on a note exactly what he wanted her to purchase. However, claiming that she had given the note back to Benson and that she no longer has it, Inspector Bonini has no choice but to take her to police headquarters. Still doubtful, Chan states that there is still one troubling fact regarding this case that he promises to explain later. Chan and Inspector Bonini go to the casino where they meet with Henry Winslow who is busy celebrating his new windfall. Chan cautions him, however, that his celebration may be premature as Benson's body has not yet been found, and thus, his death cannot be proved. With no body to prove a murder has been committed, Mrs. Benson cannot be tried for that crime. Winslow excuses himself, saying that he has an appointment with Benson's lawyer. As Winslow leaves, Chan explains to the inspector that although he is playing a longshot, but feels lucky. Leaving the casino, Winslow takes a canal gondola toward an unknown destination while Chan and Bonini follow in another gondola. Later Winslow enters a nondescript dwelling where he meets Mr. Benson. He tells Benson, who has plans to run off with Winslow and the money to the safety of another country, that, although his wife has been charged with his murder, she cannot be tried and convicted without his body being found. Benson suggests that the body of a waterfront bum will suffice, but Winslow has other plans, suddenly attacking Benson, attempting to strangle him. Suddenly, Chan and Inspector Benini enter and arrest both men. Back at Benini's office with the inspector, Alice Benson, and Dr. Durrant, Chan explains the one troubling fact that had puzzled him earlier. He notes that the spot where the air tank was found by the butler, Blair, was at a point higher on the beach's slope than where the waves reached and could not have been deposited there by the water, so it could only have been placed there by someone who, Chan explains, was Benson. The Lido – or Venice Lido (Lido di Venezia) - The Lido is a seven-mile-long sandbar in Venice, Italy. About half of the island that faces the Adriatic Sea is a sandy beach, much of it belonging to the various hotels that cater to the summer tourists. These include the renowned Hotel Excelsior and the Grand Hotel des Bains. While these beaches are private, towards the northern and southern ends of the island there are two vast public beaches. The Hotel Excelsior shows prominently in this panning shot seen at the beginning of The Point of No Return. John Benson (to Charlie Chan): "Then you must be THE Charlie Chan, the detective." 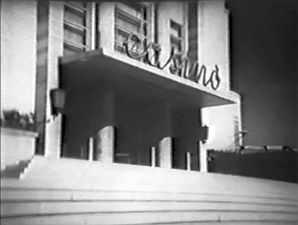 Charlie Chan (to Inspector Bonini regarding a telegram he just received): "From my number one son, in Paris..."
Casino del Lido - The Casino del lido of Venice was designed by Eugeinio Miossi and built in 1938. The interior was decorated with marble and glass. The casino closed in the 1990s. Very strange how obscure reputation, like small bottle cast into sea, should reach such distant shore. Sometimes mask of simplicity hides face of fathomless mystery. When a man is lucky he is like a boat with a favorable wind.